The difference lies between the two is that the Smooth Endoplasmic Reticulum is not bounded by the ribosomes and is known for storing the lipids and proteins. Meanwhile, the Rough Endoplasmic Reticulum is bounded by the ribosomes and store proteins. The another most essential component of the eukaryotic cell is the Endoplasmic Reticulum or ER. It occupies almost 10 percent of the total cell volume. ER is of two type smooth and rough. Though both share some common features too but differ in some. ER is membrane-bounded and is made up of cisternae, which is the network like structure. ER works for the chemical compounds required by the cell for its inner and outer environment. ER produce, sorts and transports these chemical compounds along with the storing of some of them like proteins and lipids. The ER has cavities in it, which occupies space in the cytosol, the lumen is the internal space present. The ER is connected to the nuclear membrane as well as from the cytosol by forming a connecting bridge between them. These were the essential features of the ER, but as we know even they exist in two types, which are smooth and the rough and so with the help of this content we will distinguish both of them. Smooth ER appears like containing many circular marks which are the interlocking tubular sheets and they may be varied in look and function as well. Rough ER looks like the arrangement of the double membranes which are spotted with the ribosomes all over. They appear consisting of the parallel sheets of membrane. Smooth ER is found near the cell membrane. Rough ER is found near the cytoplasm. Originates from Rough endoplasmic reticulum by giving off the ribosomes. From nuclear membrane. They do not have ribosomes. Smooth Endoplasmic Reticulum or SER or Agranular Endoplasmic Reticulum, as the name says they appear to be like smooth surface when viewed from the electron microscope as they do not contain ribosomes. The main function of the SER is the production, secretion, and storage of the lipids and steroids hormones mainly, along with that it also helps in the metabolism of carbohydrates and manufacturing new membranes. In mammalian cells, SER plays the important role in detoxification reactions from the drugs and other metabolic wastes. In liver cells, SER provides the enzyme glucose-6-phosphate, which actively participate in the metabolism. SER is formed from the Rough ER when there is the loss of the ribosomes. It does not take part in the synthesis of protein but helps in the transportation of the same. Rough Endoplasmic Reticulum or RER or Granular Endoplasmic Reticulum, when viewed in the electron microscope, it looks like an uneven surface because of the presence of the 80S ribosomes. The main function of the RER is the synthesis of the protein and then transport it to other parts. Basically in cells like fibroblast, goblet cells, hepatic cells, pancreatic cells and B lymphocytes it manufacture, sort (pack) and transport or export of the secretory proteins like antibodies, insulin, collagen, mucin, blood clotting proteins, enzymes, etc. Smooth ER appears like containing many circular marks which are the interlocking tubular sheets, while Rough ER looks like the arrangement of the double membranes which are spotted with the ribosomes all over. RER appear like consisting of the parallel sheets of membrane. 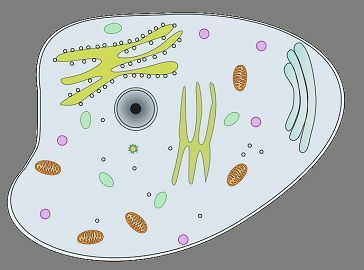 Smooth ER is found near the cell membrane and Rough ER is found near the cytoplasm of the eukaryotic cells. 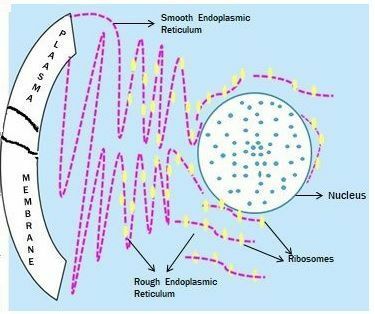 Smooth ER originates from rough endoplasmic reticulum by giving off the ribosomes, while Rough ER originates from nuclear membrane. The main difference lies between the SER and RER is the presence of ribosomes, as SER do not have ribosomes but RER have ribosomes. SER mainly produce and export lipids and protein and function for detoxification, while RER produces, secrete and export proteins and few hormones. In this article, we studied the vital part of the plant and animal cells, along with their functions and how they varied from each other. So, the Endoplasmic Reticulum whether smooth or rough has the crucial roles in the production of various molecules and their processing.